On Wednesday 8th November, the CEDA Dredging Days Technical Visit, hosted and sponsored by Jan De Nul Group, will give delegates the opportunity to see, the largest monumental inland waterway lock in the Netherlands, at close quarters, as it undergoes major expansion. The Princess Beatrix Lock is part of the Lek Canal which connects the Amsterdam Rhine Canal to the Lek River. It is an important waterway between the ports of Rotterdam and Amsterdam and is used by an increasing number of large vessels. 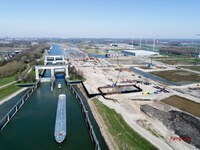 To reduce the threat of it becoming a bottleneck, the Rijkswaterstaat has commissioned a much-needed expansion of the Lock and Canal. The project will improve passage for the vessels that pass through the Canal and reduce waiting times at the Lock. To create space for the third chamber, the Lek Canal will be widened. South of the lock complex up to the mouth of the river Lek, the canal will be 130m wide. North of the lock complex, the first 500m, the canal will be 130m wide and beyond which it will gradually decrease to its original width of 85m. The Lek Dyke to the south of the lock complex is a primary flood defence and protects a big hinterland against high water on the river Lek. The new Lek Dyke and the third chamber will be part of the primary flood defence and will be designed to hold back high water levels of more than 7.80m NAP. In order to widen the canal, 211 hectares of land will have to be excavated - a total equivalent of around 2,000,000m³ of soil. For the construction of the new Lek Dyke and the third chamber, 162 hectares of land will be reclaimed - requiring about 800,000m³ of soil. The excavated soil will be processed on site or transported by ship and should create little or no inconvenience for cyclists and motor traffic. Other measures to protect the natural and built environment around the project include the relocation of flora and fauna, such as moor frogs and big loaches, to suitable areas. Cables and pipelines have also been moved to ensure uninterrupted utility services to the local communities. The historic casemates of the New Dutch Waterline dating from 1794 – a military defence line making use of intentional flooding – will also be moved to an appropriate place. Our host for the technical visit, Jan De Nul Group, is part of Sas van Vreeswijk, the project consortium responsible for managing the design, financing and maintenance programme of the Lock. The technical visit will offer a unique opportunity to look around the site and hear from those members of the consortium who are involved in the project. They will be on hand to guide us through the project and answer questions on the day. The finishing works on the new bridge over the canal. This an optional technical visit for Dredging Days delegates and there will be a charge of €50 excl. VAT. For details and to book your place please contact the conference secretariat. 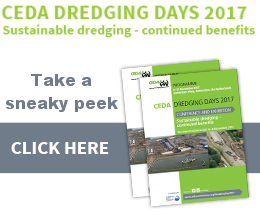 To participate in the Twitter conversation around CEDA Dredging Days 2017, please add the #dredgingdays hashtag to your tweets.